The Greenshell mussel, Perna canaliculus, represents a key component of the benthic ecosystem and supports New Zealand’s largest aquaculture industry. This study explores the effects of aragonite saturation (ΩA) manipulation upon embryogenesis and larval performance of P. canaliculus, providing an indication of the extent to which commercial hatchery water could be modified to enhance production and a preliminary indication of vulnerability to ocean acidification (OA). Commercial ‘Incubation’ and ‘Larval Rearing’ phases were examined separately. 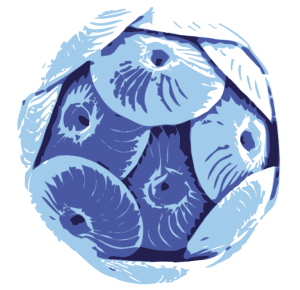 The 48h ‘Incubation’ uses static seawater containing 4µM EDTA, allowing fertilized eggs to undergo embryogenesis and form the first prodissoconch shell. ‘Larval Rearing’ supports development of grazing veligers through to metamorphosis. In Incubation, sodium carbonate enrichment created ΩA environments of 2.7, 4.8 and ~7 (pHT8.0, 8.2 and >8.5), while elevated pCO2 simulated extreme OA conditions of ΩA0.7 and 0.5 (pHT7.4, 7.3). Performance during 48h Incubation was compared to controls (ΩA1.6, pHT7.8; n=3); all veligers produced were then raised under common conditions to establish carry-over effects. The Larval Rearing trial subjected naïve veligers to ΩA similar to those described above for 18d (n=6). Incubation survival was unaffected by ΩA (~75%); however development was severely arrested in under-saturated ΩA treatments, with mussels failing to advance beyond trochophore stage at ΩA0.5 or forming misshapen, under-size veligers at ΩA0.7, ultimately resulting in 100% mortality. Enriching to ΩA4.8 increased baseline veliger, and ultimately metamorphosing pediveliger, yield by 13%. Veligers exposed to under-saturated ΩA experienced ~25% reduction in shell growth, resulting in 4.7% net pediveliger yield, compared to 15.3% in control seawater. Elevating ΩA had no apparent effect on veligers and no consistent carry-over effects were observed in settled juveniles. Embryo and trochophore stages are ultimately killed by extreme OA and, reciprocally, respond positively to enhanced ΩA, whereas larger veligers appear remarkably resilient, showing only minor growth responses.